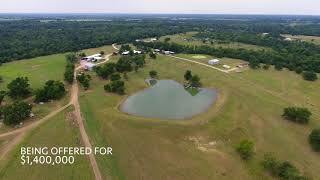 LOCATION: 2238 Hunt County Road 1081 Greenville, TX 75401.
a short distance off FM Highway 2194. Home and improvements are situated on 285 (+) or (-) acres. with solid stain, and the windows are doubled pained. utility room with plenty of cabinets, room for a freezer, and a small hobby room. duel sinks with a recently updated walk-in shower. stunning views in all directions! almost exclusively on the property. number of small grazing paddocks. palpation cage, crowing alleys, and a sweep 60 ft. diameter round pen. to the poultry processing room, which both are operational. but has unique sales counter, shelves, and wood burning stove. on both ends for drive in convenience. large sliding door. Metal shelving units and work table stay with shop. LOCATION: 2238 Hunt County Road 1081 Greenville, TX 75401. Although the REHOBOTH is secluded and quiet, it is easily accessed by US Highway 69 north of Greenville, and is located on a dead-end county road, a short distance off FM Highway 2194.